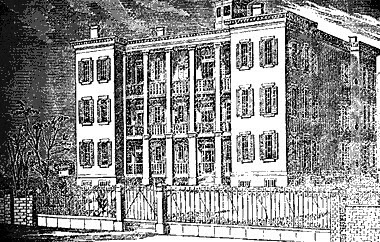 The Continental Congress of 1776 encouraged enlistments during the Revolutionary War by providing pensions for soldiers who were disabled. 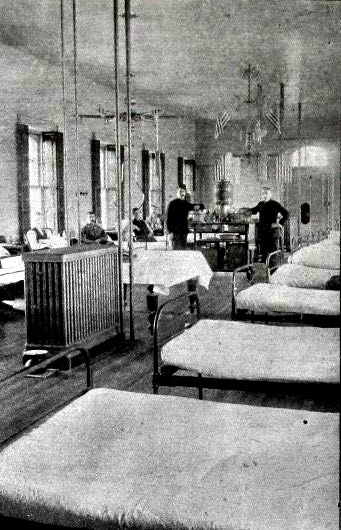 Direct medical and hospital care given to veterans in the early days of the Republic was provided by the individual States and communities. 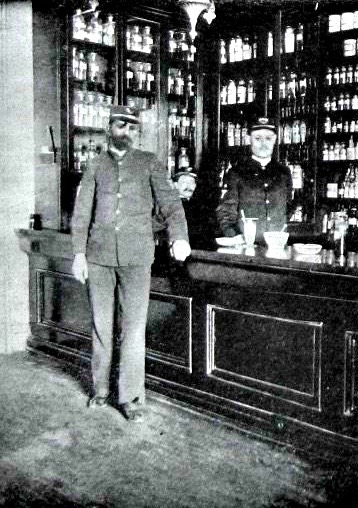 In 1811, the first domiciliary and medical facility for veterans was authorized by the Federal Government. 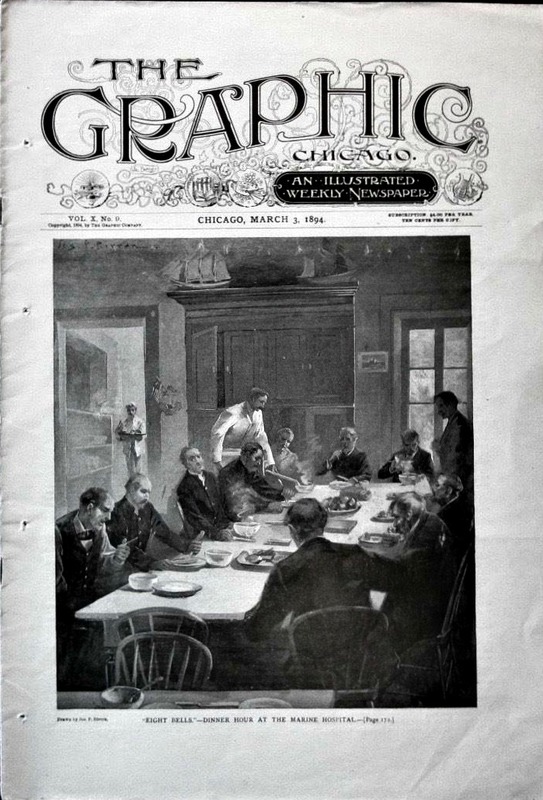 By the mid 19th century, the nation's veterans assistance program was expanded to include benefits and pensions not only for veterans, but also their widows and dependents. 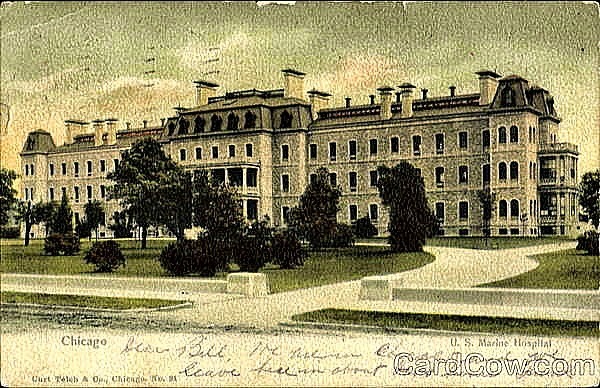 After the Civil War, many veterans homes were established. Since domiciliary care was available at all U.S State veterans homes, incidental medical and hospital treatment was provided for all injuries and diseases, whether or not of service origin. 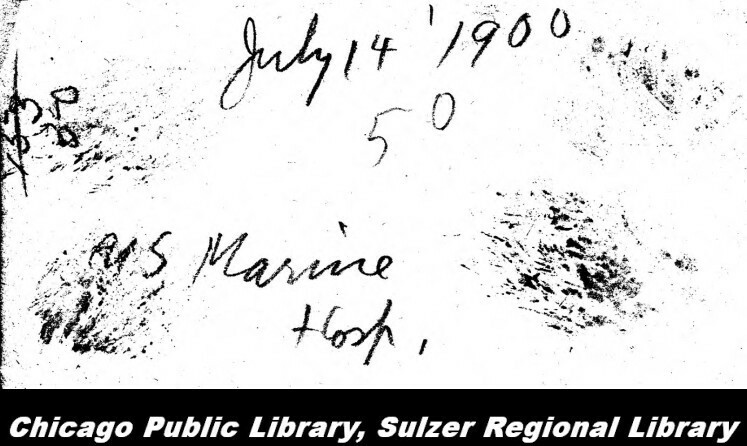 The marine hospitals grew rapidly during and after the Civil War. 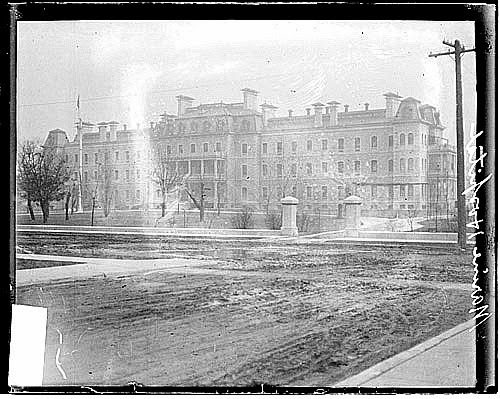 Indigent and disabled veterans of the Civil War, Indian Wars, Spanish-American War, and Mexican Border era ... as well as discharged regular members of the Armed Forces were rehabilitate at these facilities. 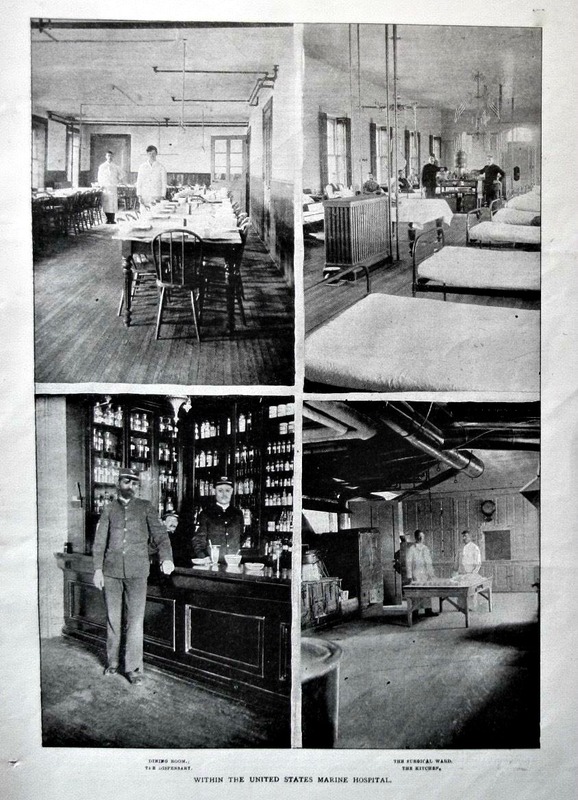 These rehabilitation facilities were called Marine Hospitals. An artist depiction of the Marine Hospital once located at 4141 N. Clarendon Avenue in the Township of Lake View. 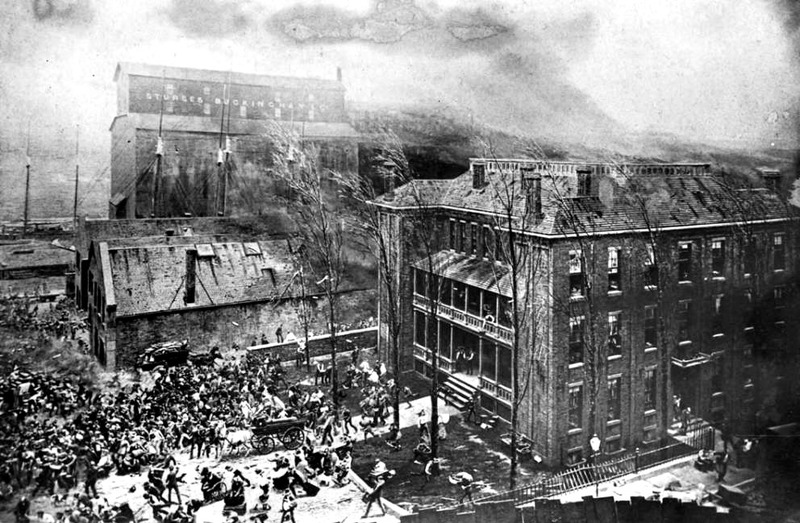 Chicago's first military hospital was destroyed during the Chicago Fire of 1871 with all patients transferred to Mercy Hospital by 1873 before the Lake View location was operational according to a publication called The Annual Report of the Supervising Surgeon General of the Marine Hospital in 1879. 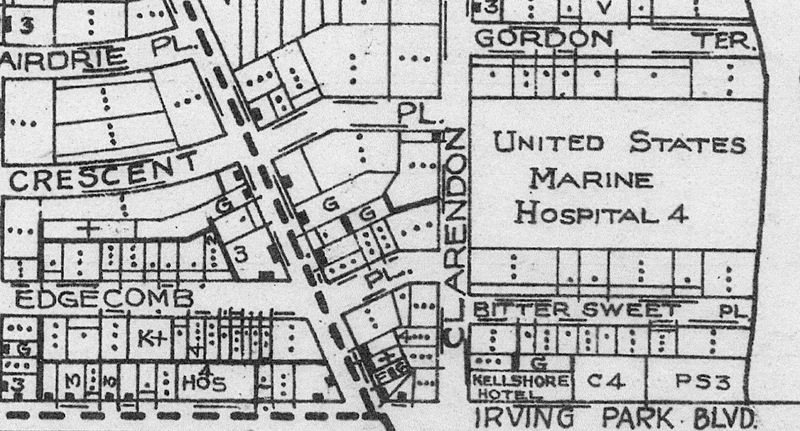 This 1922 University of Chicago map (zoomed) shows the hospital along Clarendon Avenue north of Irving Park Road along the existing bluffed configured lakefront. 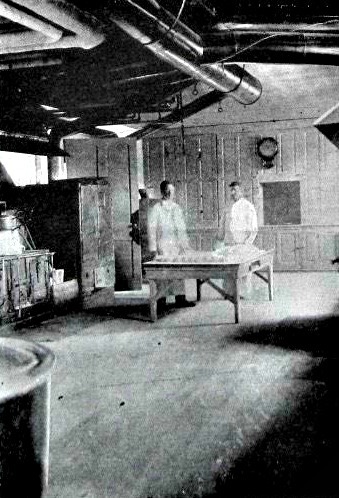 Ships would dock to de-boarded patients in the 19th century. 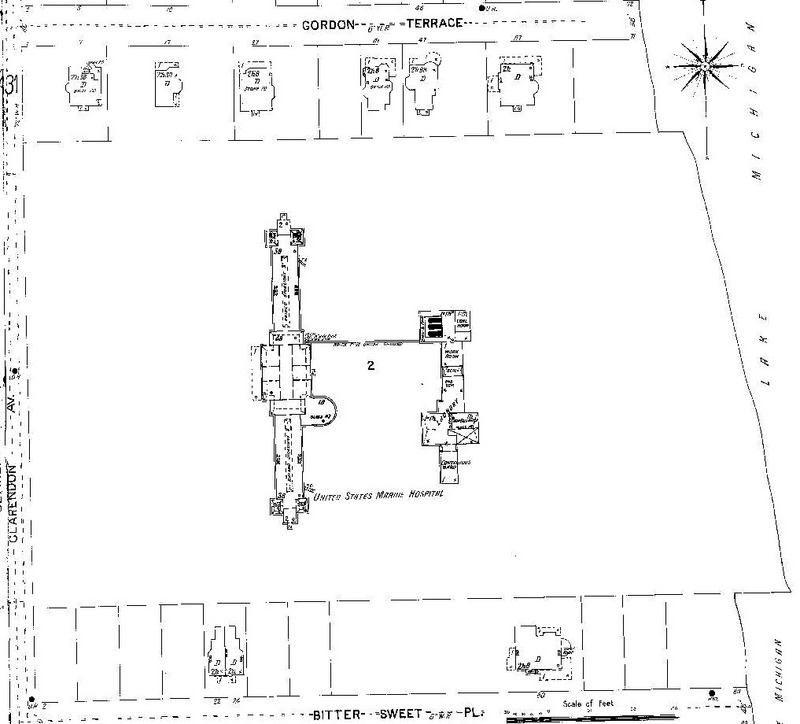 This is not the exact location image but it does give the reader an idea of what might have been at this location. 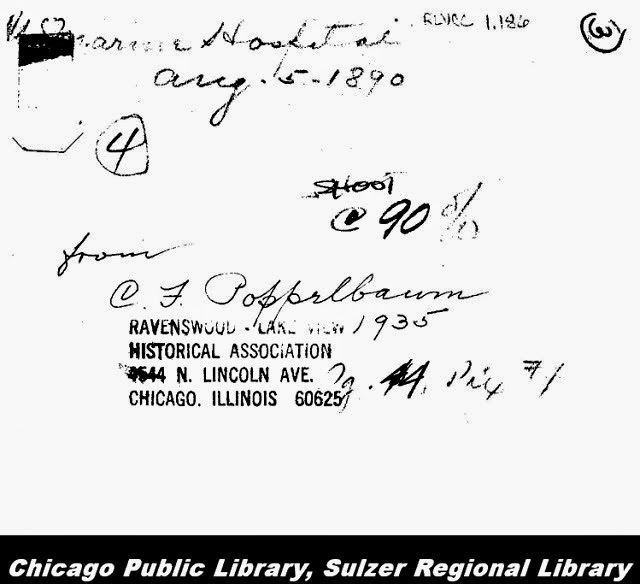 After the Civil War (1865) there was a need to accommodate long-term medical needs of the military veterans. 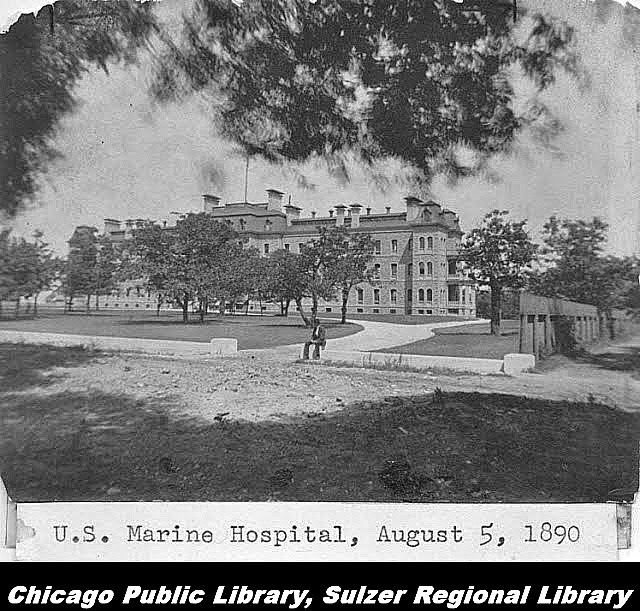 The U.S. Marine Hospital for Sailors and Soldiers was commissioned in 1864 and was located at 4141 N. Clarendon (1873 – 1972) helped meet the needs of veterans in the 19th century and early 20th. 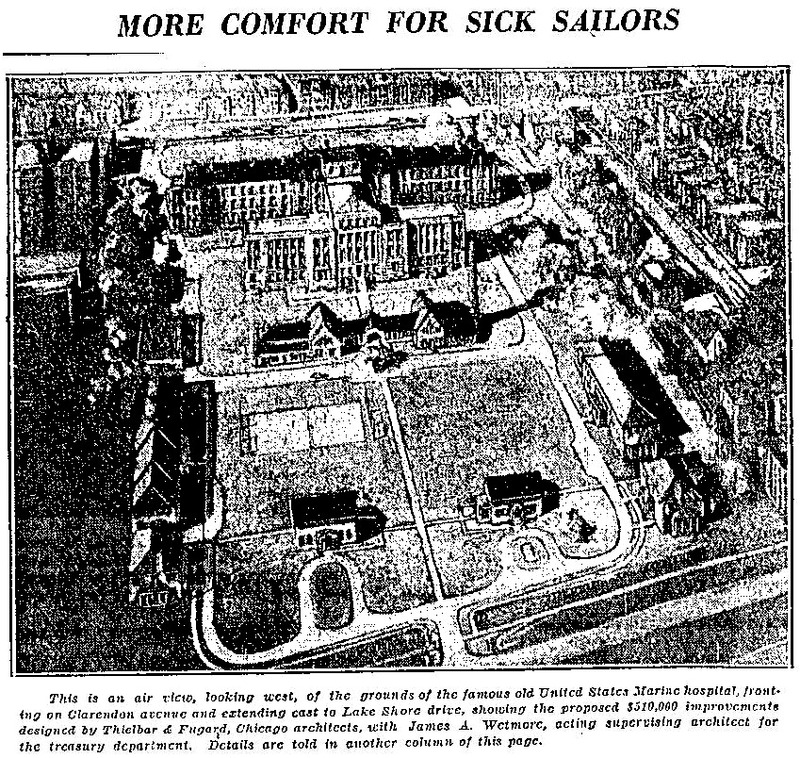 The military hospital was in the center of a tranquil, park-like 12-acre site blocks away from the lakefront. 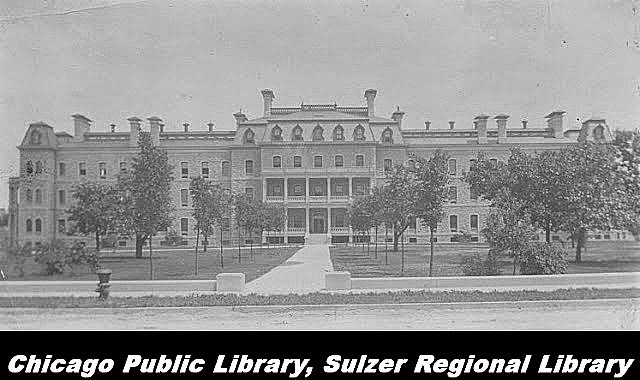 The entire building was built of lemon stone, and handsome stone porches graced the various fronts. The main building, which was 350 x 60 feet in area, contained the offices, executive departments, dispensary, and administrative department. 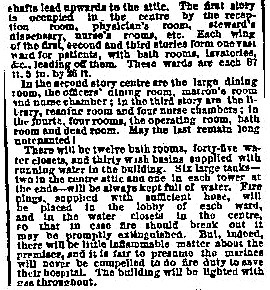 Each hospital wing contained three wards that accommodated twenty patients to each ward that were thirty feet wide. 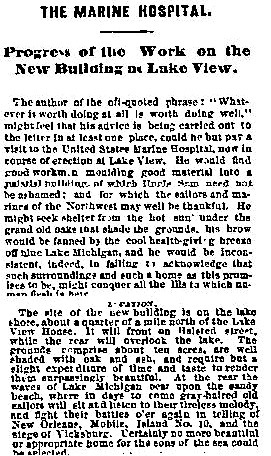 The best medicine at the time were lakefront breezes and the the pastoral surroundings of rural location. 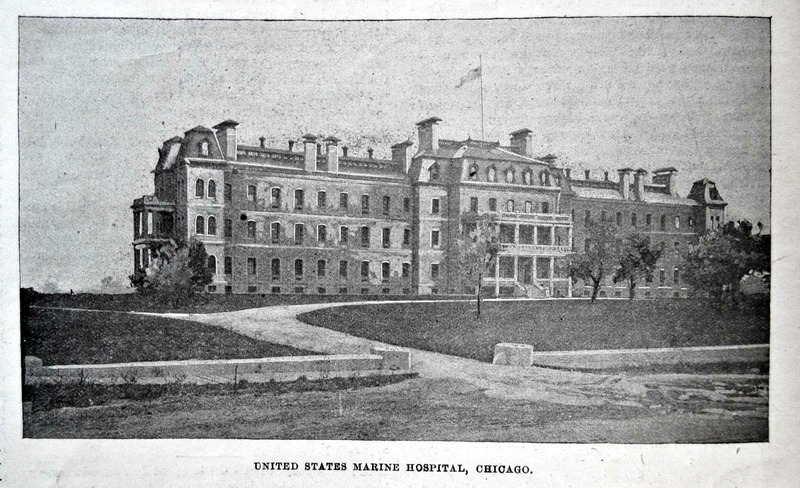 "Upon the lake shore just north of Graceland Avenue (Irving Park Road) stands the United States Marine Hospital a magnificent stone building 360 feet long and four stories high It has just been completed at a cost of $500,000. Its location in the center of a lot of ten acres upon a ridge fronting the lake and being in full and near view of all the passing shipping of the harbor is one which for healthfulness beauty and appropriateness cannot be surpassed anywhere. The improvement and decoration of the hospital grounds already commenced will not be completed until next season. 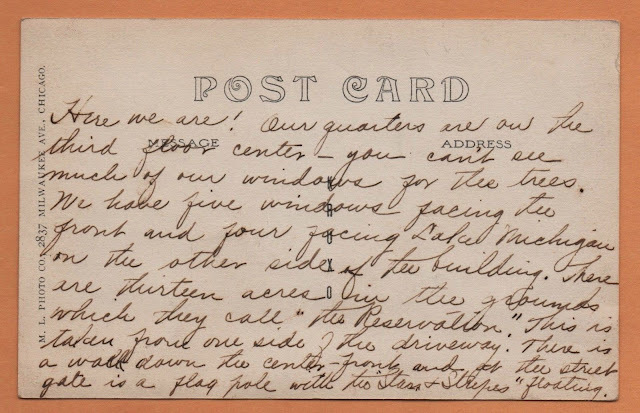 Government buildings and grounds everywhere kept with extreme neatness and taste are always desirable neighbors. The United States Marine Hospitals and Soldiers and Sailors Homes at Washington Pensacola and other places are the centers of park neighborhoods and so we confidently predict that the lake shore property in this vicinity will within five years present an exceptionally fine line of villa residences." "Situated [along] the lakeshore a few miles north of the city and Graceland Avenue (Irving Park Road) is one of the most important of Lake View. 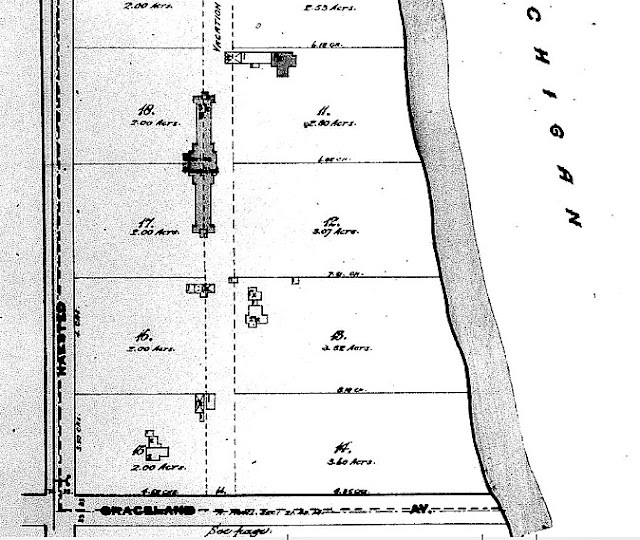 The grounds comprising acres were purchased and the first building commenced in 1868. 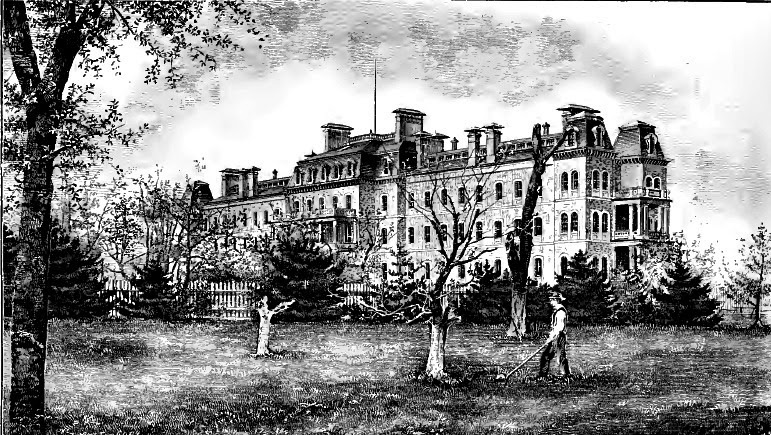 It was finished in 1873 and in September of that year was occupied for general hospital patients. 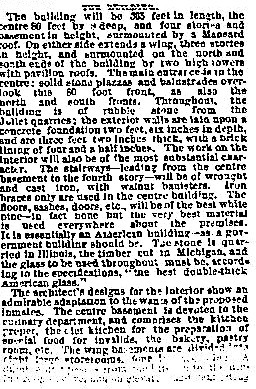 In 1882 the interior was entirely remodeled and repaired at a cost of $48,000. 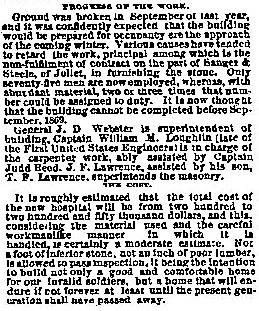 As it stands to day the hospital building is a large brIck structure 360 feet in length and four stories in height. 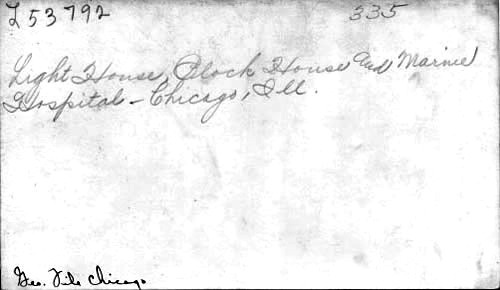 Its officers are as follows: Truman W Miller surgeon, WA Wheeler assistant surgeon, JH Rowles acting surgeon, T Villiers steward. As its name implies the Marine Hospital is the harbor of refuge for those following a seafaring life.The wards are six in number and each ward contains twenty beds the statistician and sanitarist being pleased to discover that the number of cubic feet of air accorded to each patient is equal to that allowed in the best institutions in the country says the Chicago Tribune in a late review of the workings of this institution. The heating is done by steam and every steam coil is supplied by fresh air. The ventilators are numerous every bed having one at its head which leads into a heated ventilating shaft. These means insure a steady flow of pure air into the wards The steam pipes are uncovered making the discovery of breakages easy as well as their repair and beyond this removing all danger of their heating and setting on fire their surroundings. The drainage system here in use is as near perfection as plumbers have been able to make it The traps of slop-basins and water closets are ventilated into separate heated shafts as well as the rooms in which they are placed. Everything is absolutely free from odors and sewer gas. 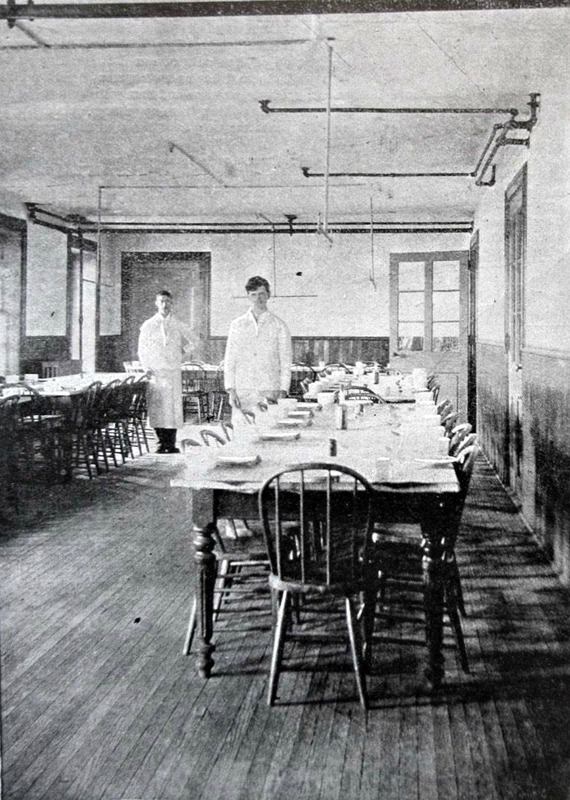 The building as originally designed by the United States architect was ill suited for its purpose but the present surgeon in charge Dr Miller has practically remodeled and rebuilt its interior. The executive part forms the center of the hospital while the wards occupy the wings and they are to some measure though not entirely isolated. 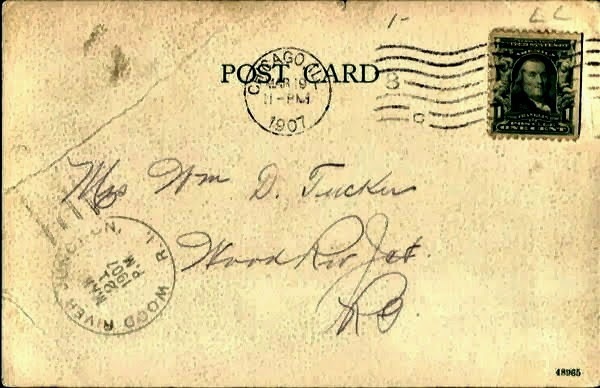 It was not possible if the building was to continue in use to absolutely reach this result. The whole house is scrupulously clean from top to bottom. The food furnished to the patients is of the best quality and its average cost per patient is twenty seven cents per day. hospital. 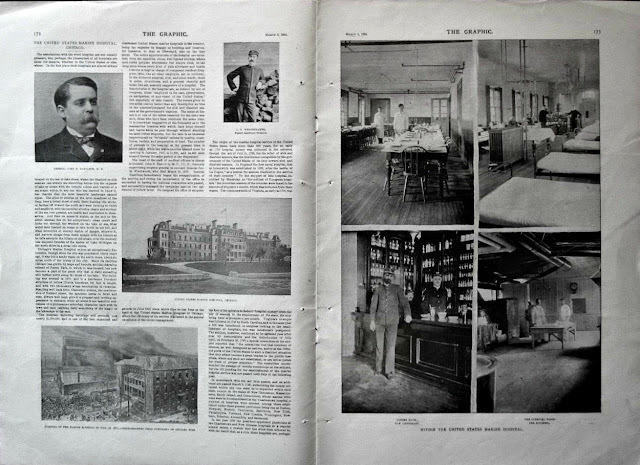 The surgeon in charge makes a few cadet appointments every year." 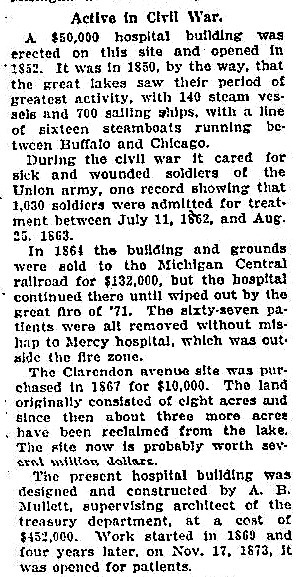 The Chicago Tribune articles below tell a tale of evolution for the building as a hospital and property that surround it. 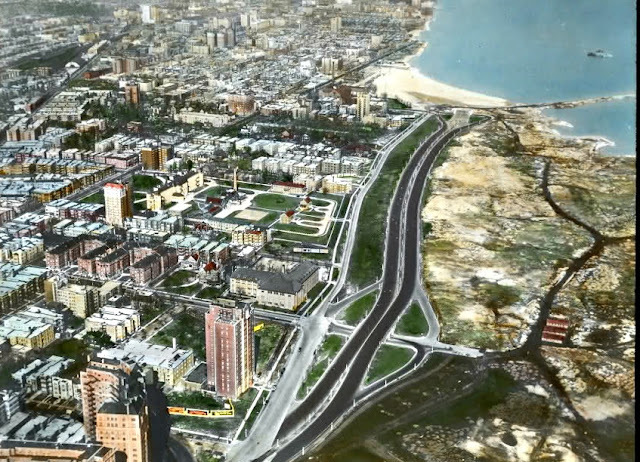 Lincoln Park expands again northward by late 1920's to Montrose Avenue with the construction of the harbor by the early 30's. 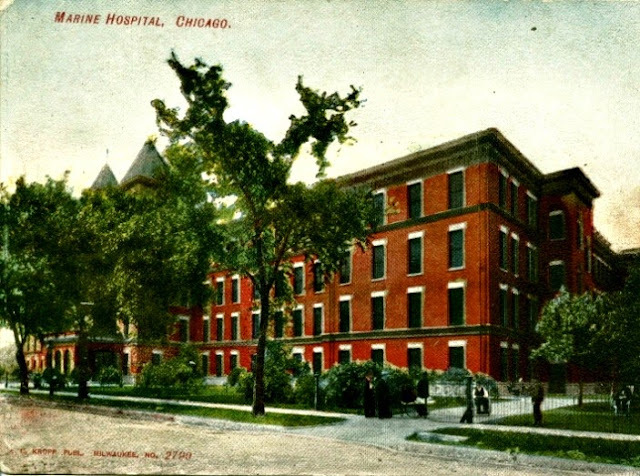 The hospital in the photo is towards the center left of the photo along Clarendon Avenue with the expanse open landscape near the newer extension of Lake Shore Drive. 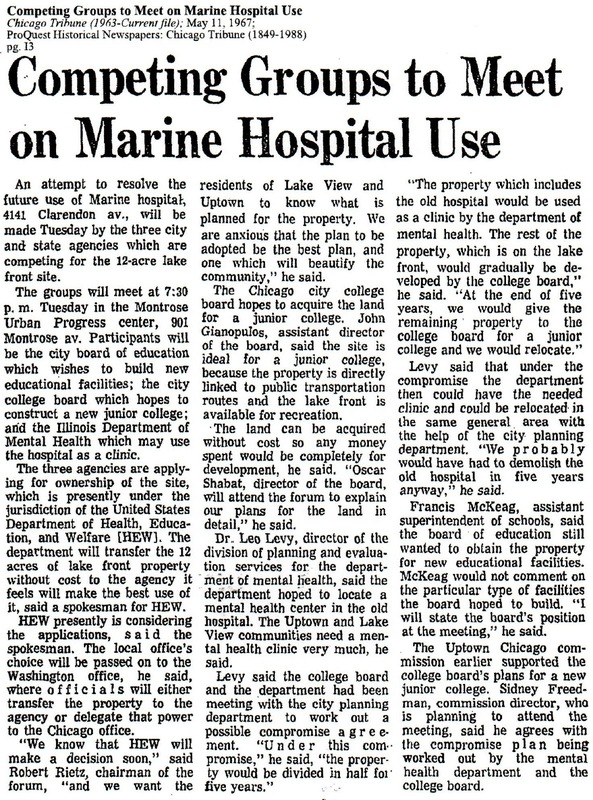 According to my readings, the hospital was declared surplus property by the federal government in 1965 and had been fought over by the city & state educational and health agencies for some time. 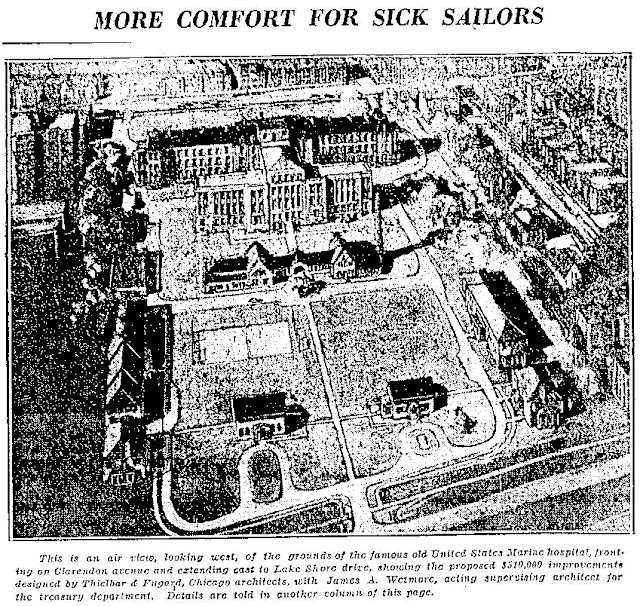 In 1969, a Chicago Public Building Commission approved the acquisition of the abandoned 12 acre Marine Hospital building and property for the construction of an unconventional (pod-like classrooms) elementary school. This innovative school was the first magnet school in Chicago that is located in the neighborhood of Uptown - Walt Disney Magnet School - built by 1972. The property just west of the school housed the hospital.